When we talk about insects in general terms, we use commonly accepted names for large groups such as the beetles, the wasps, the ants and the butterflies and moths. All of these common names indicate the scientific order in which these bugs have been placed. The beetles are in the order Coleoptera. The butterflies and moths are in the order Lepidoptera. Dragonflies and damselflies are in the order Odonata. A quick translation of the word Odonata is “toothed ones,” a reference to the awesome, toothy lower lip, or labium, which is used to capture and hold prey while their mandibles do the eating. “Odonata” was coined by the entomologist Fabricius in 1793. The order Odonata is divided into two suborders. 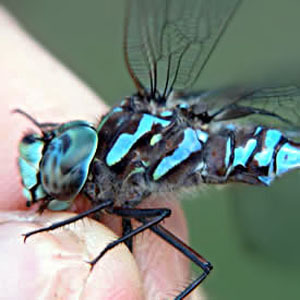 Anisoptera, the suborder of the dragonflies, means “different wings” as their hindwings are distinctly larger and differently shaped than their forewings. The damselflies are in the suborder Zygoptera, which means “same wings,” as their forewings and hindwings are about the same size and shape.